The Software License and Royalty Agreement can be used, for example, if you are selling software or other media that is licensed rather than sold outright. Protect your intellectual property by licensing its use rather than selling it outright. using these for years, and they have undoubtedly saved us time and stress." This Software License and Royalty Agreement is included in editable Word format that can be customized in Word or by using the included Wizard software. This Licensing Agreement (the "Agreement") is entered into this Current Day day of Current Month, Current Year by and between Company Name, a State company (hereafter "Licensee"), and Company Name, (hereafter "Licensor"). Insert description of media areas and design. 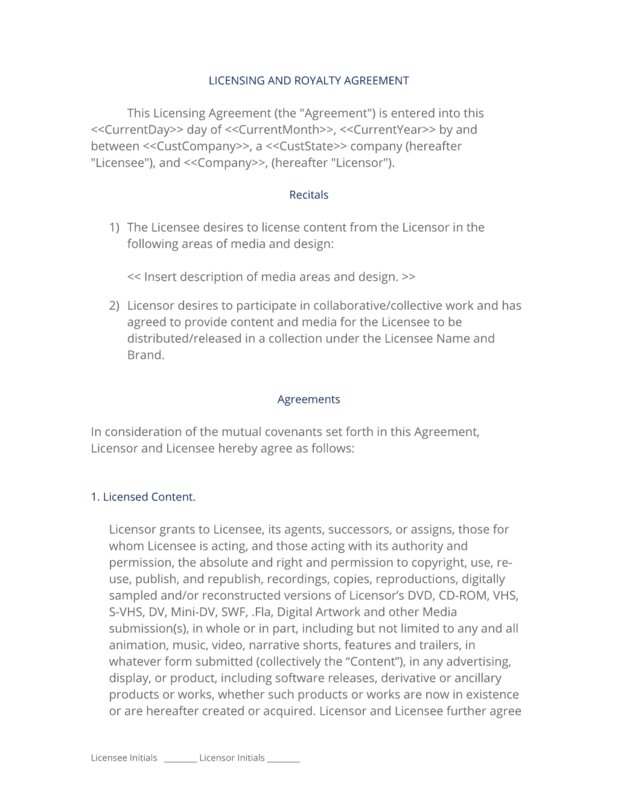 Licensor desires to participate in collaborative/collective work and has agreed to provide content and media for the Licensee to be distributed/released in a collection under the Licensee Name and Brand. Licensor grants to Licensee, its agents, successors, or assigns, those for whom Licensee is acting, and those acting with its authority and permission, the absolute and right and permission to copyright, use, re-use, publish, and republish, recordings, copies, reproductions, digitally sampled and/or reconstructed versions of Licensor's DVD, CD-ROM, VHS, S-VHS, DV, Mini-DV, SWF, . Fla, Digital Artwork and other Media submission(s), in whole or in part, including but not limited to any and all animation, music, video, narrative shorts, features and trailers, in whatever form submitted (collectively the "Content"), in any advertising, display, or product, including software releases, derivative or ancillary products or works, whether such products or works are now in existence or are hereafter created or acquired. Licensor and Licensee further agree that such right and permission has been granted to Licensee on an exclusive basis for use in the Software Graphics Market. The Content may be copyrighted, used and/or published individually or in conjunction with other photography, video works, and recordings, and in any medium (including without limitation, print publications, public broadcast, CD-ROM format) and for any lawful purpose, including without limitation, trade, exhibition, illustration, promotion, publicity, advertising and electronic publication. Licensor waives any right that Licensor may have to inspect or approve the finished product or products, or any advertising copy or printed matter that may be used in connection with such product, or the use to which it may be applied. Licensor releases, discharges and agrees to hold harmless, Licensee, its agents, successors or assigns, and all persons acting under its permission or authority, or those for whom it is acting, from any liability by virtue of any distortion, alteration, digitization, reconstruction, or use in composite form, whether intentional or otherwise, that may occur or be produced in the recording and subsequent reconstruction of the Content, or any other subsequent processing thereof, as well as any publication of the resulting materials. Licensor warrants that Licensor is of legal age and has every right to contract in Licensor's own name in this matter. Licensor further warrants that Licensor has the full right and authority to license the properties to Licensee as provided herein and agrees to indemnify and hold harmless Licensee from any and all expenses, suits, judgments, damages and related costs and fees arising out of Licensor's actions, omissions, negligence or otherwise under this Agreement. Licensor acknowledges that Licensor has read this Agreement prior to its execution, and that Licensor is fully familiar with its contents. Nothing herein shall be construed to create an employer-employee relationship between the parties. The consideration set forth above shall be the sole payment due to Licensor for services rendered. It is understood that the Licensee will not withhold any amounts for payment of taxes from the compensation of Licensor and that Licensor will be solely responsible to pay all applicable taxes from said payment, including payments owed to its employees and subagents. In the course of performing services, the parties recognize that Licensor may come in contact with or become familiar with information which the Licensee or its clients may consider confidential. This information may include, but not limited to, information pertaining to design methods, pricing information, or work methods of the Licensee, as well as information provided by clients of the Licensee for inclusion in Web sites to be developed for clients, which may be of value to competitors of the Licensee or its clients. Licensor agrees to keep all such information confidential and not to discuss what evolved any of it to anyone other than appropriate Licensee personnel or their delegates. The parties agree that in the event of a breach of this Agreement damages may be difficult to ascertain or prove. The parties therefore agree that if Client breaches this Agreement, Licensee shall be entitled to seek relief from a court of competent jurisdiction, including injunctive relief, and shall be entitled to an award of liquidated damages. This Agreement shall be binding upon and shall inure to the benefit of Licensee and to the Licensee's successors and assigns. Nothing in this Agreement shall be construed to permit the assignment by Licensor of any of its rights or obligations hereunder to any third party without the Licensee's prior written consent. All plans, ideas, improvements or inventions developed by Licensor during the term of this Agreement shall belong to the Licensee and/or its clients for whom work is being performed, as it relates to the Licensee's core products and Intellectual Property. Licensor shall, however, retain the right to display works s/he creates for Licensee in their portfolio, subject to Licensee's written approval in advance, said approval not to be unreasonably withheld. This Agreement shall be governed by and construed in accordance with the laws of the State of State. Exclusive jurisdiction and venue shall be in the County County, State Superior Court. The prevailing party shall be entitled to recover its reasonable attorney fees and statutory costs. To any portion of this Agreement declared unenforceable, that portion shall be construed to give it the maximum effect possible, and the remainder of this Agreement shall continue in full force and effect. The complete Software License and Royalty Agreement - with the actual formatting and layout - is available in this Contract Pack.